Like this? Support me on Patreon! Picture a pill bug, roly poly, woodlouse, or doodle bug, an animal found under rocks and logs throughout the United States. Now picture an animal similar to that pill bug, but as big as a cat, crawling across the Gulf of Mexico. That is the giant deep-sea isopod. The deep waters of the United States’ Exclusive Economic Zone is home to this large, recognizable animal, which can reach almost 2 feet in length. Since their discovery in the late 19th century, giant isopods have captured the public’s imagination, acting as an Ambassador Species for deep-sea ecosystems. Ambassador Species are important for education, exploration, and conservation as they provide a charismatic icon to help introduce people to new and unfamiliar places. Today, Craig McClain, along with a massive team of ocean scientists (including me!) published our monumental paper: Sizing ocean giants: patterns of intraspecific size variation in marine megafauna. This massive monograph investigates patterns of size among 25 ocean giants, the biggest, most massive members of their respective taxa. You can probably guess which species I had a hand in reviewing. Along the way, I learned quite a few cool things about the magnificent giants of the deep sea. Today marks the end of Geoff Johns’ 25-issue run as lead writer for Aquaman. It is not hyperbole to say that he revitalized the king of Atlantis and helped cast off the stigma of the Superfriends. Aquaman was no longer a one-trick hero floundering about for relevance, trying to find his plaice in the DC Universe. Johns’ Aquaman had depth. The characters were compelling, the stories engaging. And, after more than 2 years, it was clear that this new Aquaman wasn’t just a fluke. All puns are most definitely intended. In honor of Johns’ 25 issue run, it’s time to plumb the depths of his ultimate issue and do what I do best: over-analyze a comic book and dredge up as much tenuous symbolism as possible. This is Southern Fried Science and I’m talking about Aquaman, what else would you expect? Here we find Aquaman diving deep into the Trench, searching for an army of lost Atlanteans to command. During the course of his dive, we discover that, though Aquaman is fighting to reclaim Atlantis, his one overarching goal is to find his wife, Mera. It is not a coincidence that we see him surrounded by deep-sea anglerfish — Melanocetus johnsonii to be precise. 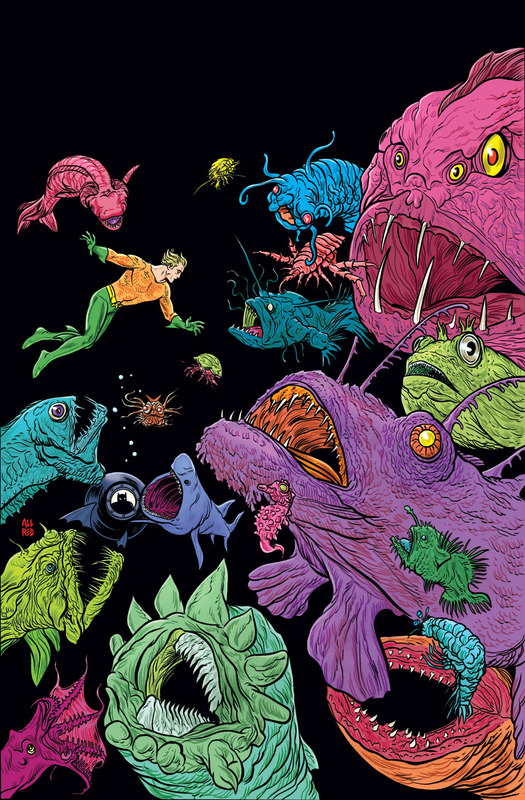 In many ways, the life-history of the anglerfish mimics Aquaman’s relationship to Mera.